Aluminium Offshore is a pioneer in the design and production of aluminium alloy structures. As one of the largest, specialist design-and-build companies in the region, we offer a complete design, supply and assemble package to customers who are looking to upgrade traditional steel and concrete designs to a lighter and more corrosion resistant metal. We offer a range of products, including XE enhanced safety helidecks, XD standard helidecks, aluminium offshore structures, helideck support frames and deck integrated fire fighting system (DIFFS). The most critical moments of helicopter operation are during landing and takeoff. An accident at either of these stages can result in hundreds of gallons of jet-fuel spilling, and a crash and burn scenario is always a frightening possibility. XE enhanced safety helidecks were developed to reduce these risks and make passenger safety a top priority. The UK Civil Aviation Authority recommends using XE enhanced safety helidecks for unmanned platforms and for areas where additional helideck safety may be desired. XE enhanced safety helidecks are currently installed on numerous offshore vessels, FPSOs and drilling platforms, hospitals and other locations. They can be fitted to new-build structures or retrofitted to existing locations. A standard aluminium helideck is a good investment. Not only will its residual value appreciate over time, it can be reused several times, as it will usually outlast the structure it is initially placed on. The cost of a standard aluminium helideck is also low compared with steel. We have an extensive track record in designing, producing and installing large offshore structures in aluminium alloy. In many cases, these structures are unique and ‘world-firsts’, requiring extensive applied research in material technology, joint configurations, fatigue design and fastening methods. Carrying forward the advantages of using an aluminium helideck, an aluminium helideck support frame becomes a logical next step. We design and build these support frames and then pre-fabricate and trial fit them at our factory. They are then packed in containers and shipped to you in knocked-down form. Re-assembly requires fasteners only and is an extremely quick process. A typical support frame for a 22m deck will require one week for assembly. Aluminium alloy helideck support frames offer 60% weight savings over the steel equivalent, as well as considerable cost savings. They are completely maintenance free and no welding, painting or blasting is required. They are lightweight, re-usable and recyclable. We provide full helideck fire fighting and safety equipment in accordance with Civil Aviation and related codes, including foam monitors, complementary media and rescue equipment. We strongly recommend that the primary fire fighting system for a helideck should be a deck integrated fire fighting system (DIFFS). A DIFFS unit has multiple nozzles that are installed flush with the helideck surface. In case of fire, these nozzles automatically telescope and spray water or foam evenly on to the deck. Our next-generation, automatically operated DIFFS unit is sensor-activated for automatic operation, is fully fire-tested in accordance with 2008/2009 standards and is available in water spray and foam spray options. There are numerous timber-decked helidecks all around the world, most of them built in the 1960s and 70s and now reaching the end of their useful lives. In many cases, the steel support frames that support the timber decking are still in serviceable condition and only the timber needs to be changed. 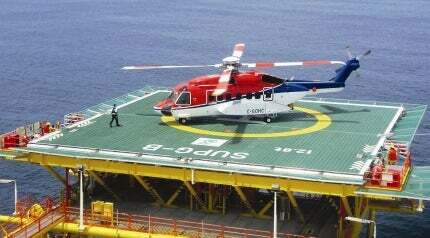 We design and produce a special timber refit decking system (TRDS) for helidecks in various sizes and configurations. This system is meant to be a direct swop for the timber. More than 30 helidecks have been changed using the TRDS since 1990 and in all cases the aluminium decking is designed to be top-installed without the need for scaffolding or hot work offshore.